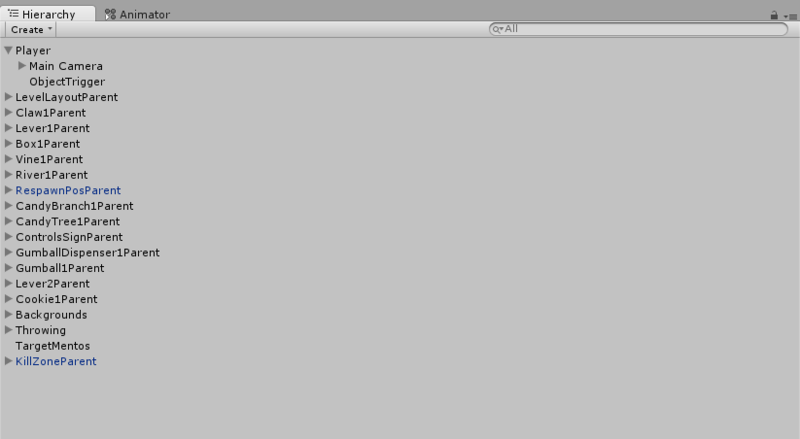 This is a really strange bug I experienced, which I don’t entirely understand. To me it felt like a ghost story and I’d really like to share it with everyone, so I’m trying to make this as easy to understand to non-coders as possible! This “KillZoneScript” is attached to a river, which is supposed to kill the player when they touch it. It does two things: The first is that it find a reference (basically a hyperlink) to the Player-Object when the game is started. The second is that -when the player touches the river- it tells a script that is attached to the Player-Object to run a method in it, which will do the actual death animation etc of the Player. 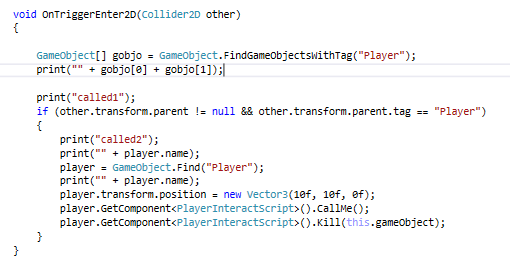 I learned that there were indeed TWO GameObjects tagged as “Player”, which are the “Player(Clone)” (gobjo) that I noticed was weird, as well as the Object named “Player” (gobjo), which had to be the correct object! And no matter what I did, searching manually or through the search function, whether it was while the game was playing or not, the “Player(Clone)” object would not show up! 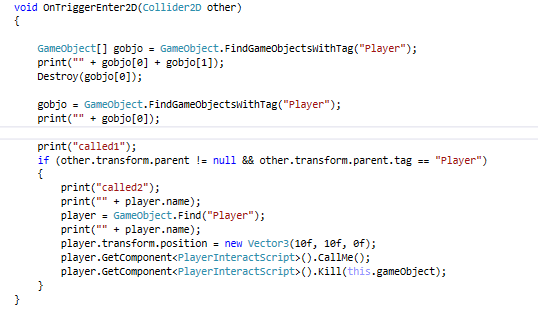 Since I knew that “gobjo” contained the evil Clone-Spirit-Demon, I made the method destroy that object during play, so I could see whether that would allow the rest of the method to work. I didn’t quite figure out yet how I would fix it in the long run, since anything that happens during play will be reset once the game is stopped. However as it turned out, I didn’t need to! Mysteriously, the “Player(Clone)” object was destroyed, and remained gone even after leaving play-mode! And so the spirit of the Player-Object was banished to the depths of the GarbageCollector, and was never heard of again (?). This was a bit of a weird post, but I really felt the need to share this. I hope I could entertain some of you, maybe even someone that is not an experienced coder!